Turning is an incredible amount of fun in a lot of ways; it's very satisfying to get something done quickly. Equally well you can destroy a piece with shocking speed. For someone who said she doesn't know what she is doing your end results are pretty impressive. Nice job! Graham, it is definitely fun! The lathe seems a little dangerous to me at this point, but I'm sure a class will help. Rob, I imagine you have to sharpen your tools frequently when you turn African Blackwood! There is probably a local turning guild in your area. They usually give lessons free or cheap! here are a couple of links. They look like they wrapped so be sure you get the whole thing. eep up the good work! Turning is just carving where the wood moves instead of the tools! 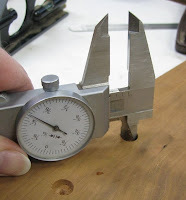 Some times the thin sections of wood will flex if the tail stock is too tight, it will certainly exacerbate the problem. Why don't you have a go at turning on a pole lathe? Very traditional, more forgiving of mistakes and great exercise too! 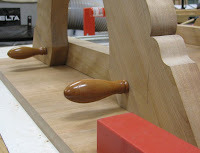 www.bodgers.org.uk is the web site of the Association of Pole Lathe Turners in the UK. Kind regards from across the pond. Pole lathes are cool, David. Thank you for the link— yet another site to distract me from work...sweet! Warm regards from this side of the pond.